Heartless capitalist: After police padlocked and reinforced the gate of Government House with a metal pipe, some women workers cry out, "This gate is nothing! The factory gate was higher and we still got in." 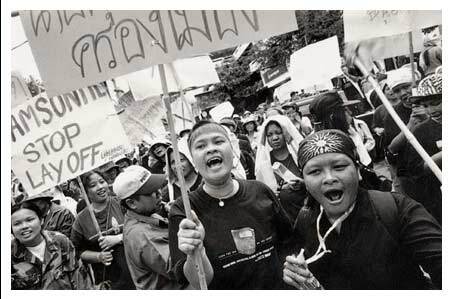 Waving placards with the words, "Evil Inhuman Capitalists Take Over the Country"; "Bleeding Workers Dry" and "Taiwanese Boss Transgresses Thai Labour [Law]", they chant in unison, " Prime Minister Taksin, feed us!"